I would like to ask all team members to try their very best to comply with the local customs in Pakistan. Among the most important of these is wearing long pants and long sleeve shirts while in Islamabad and on the journey to Skardu. It's not illegal for people to wear shorts in Pakistan but doing what we can to respect local culture will go a long way in gaining the respect and acceptance from the locals. I just wanted to remind team members to please bring at least 6 passport photos. They do not have to be the official ones required for a passport . I usually print out a contact sheet of photos and cut them myself. Color or B&W. nope, mainly for permits. They don't need to all be the same. During the expedition, will the blog be accessible to anyone wishing to know what’s going on? Also, Stu had mentioned he would send quick notes to friends and families by mail. Is this still in the picture? This blog is going to be accessible to the world while we are on the mountain. 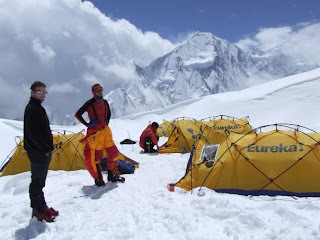 We will be updating it directly from base camp and higher using the PDA and sat phone. Stu will be sending updates to friends & family throughout the expedition.